Speed Squares provide an incredible bang for your buck. They’re pretty inexpensive and they’re dead useful. In fact, any contractor worth his salt will have one handy most of the time. The reason for this is that you can accomplish a multitude of different tasks. It provides a straight edge, it allows for quick scribing, and it can find angles and pitches quickly. If you feel like you’re not getting the most out of yours, we’ve laid out the basics for how to use a Speed Square. As a point of reference, Speed Squares are like Sawzalls. They’re technically called rafter squares, but the original was so groundbreaking that everyone still calls them by the name Swanson gave theirs. The Speed Square was made for scribing lines quickly. It has a lipped straight edge that provides 90° and 45° angles. 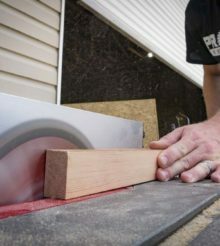 Holding the lip of the Speed Square against a board, you can mark out perfect perpendicular and 45° lines as quickly as it takes to slide the Speed Square around. It also includes a scribe bar under its ruler. The scribe bar has notches every 1/4″. So, say you need to trim 1-1/2″ off the side of a board. Just drop your pencil into the appropriate notch and run the lip of the Speed Square down the edge of the board. Incidentally, the lipped fence on the tool allows you to use a Speed Square as a guide for a circular saw. No more jankety, freehanded circular saw cuts for you, my friend. Holding the Speed Square in place, you’ll slide the circular saw down the edge of the Speed Square for perfect 90° and 45° cuts every time. Hey, we’ve got a video for that! Although Swanson originally invented the Speed Square, the tool has plenty of other manufacturers that make something similar. The advantage of the original, however, is that Swanson includes their patented diamond cut-out, which allows the user to square from an angled line scribed on the board. The bottom edge has all of your angle markings, which allows you to use a Speed Square find and mark out any angle you might need. Simply move the pivot point against the edge of your board, lining up the edge of the board with your desired angle. You can use a Speed Square to find pitches. As a matter of fact, finding the pitch of a roof was the motivating factor for how this tool was invented in the first place, hence it’s official name – the rafter square. A Speed Square will have two specialty protractor angle guides on the inside of the tool, which has both common rafter angles and “hip-valley” angles marked out. You can also use a Speed Square to find level if you’re on the job without a spirit level. Basically, you’ll set the long side of your Speed Square against your surface, and hang a plumb-bob off of the pivot point. Gravity kind of takes care of the rest, and you’ll know your surface is level if the line hangs at the 45° position. Admittedly, this article presents more of a simplified overview of how to use a Speed Square. For more detailed instructions, take a look at Swanson’s Speed Square Manual for the full breakdown of everything this tool can accomplish. To purchase one of these handy, multi-purpose tools, visit our friends at AcmeTools. Very well written and good pictures. Thank you. On my shopping list, but which size do people recommend? Brandon Fry. There are very few more useful tools out there!